Some men are born heroes. Others become living legends over time. Some, like “strongmen,” journey through eras as heroes and legends and are remembered that way forever. Extraordinary strongman Eugen Sandow, today regarded as the “Father of Modern Bodybuilding,” truly once wrestled a lion and was also a mentoring force to future real-life Olympian, Launceston Elliot. Sandow (2018) suggests how their paths crossed for fame, money, respect, and of course the love of sport. Each attained worldwide recognition because of their achievements. Sandow became a pop star of sorts, worshipped for his physical prowess and perfect physique; Elliot won an Olympic gold medal yet was never elevated to superstar status. In the opening credits, “via stock footage” filmmaker Alexander Cooper showcases Sandow going fist to claw with a lion in a poetic ballet danced to music that cleverly merges into a modern day panorma (filmed by drone) of the Olympic Stadium in Athens, Greece. We become acquainted first with an aged Launceston on a cemetery stroll with a newspaperman. His memories, his tales of Sandow, begin. To understand the impact the strongman would have on Elliot’s life as a young weightlifter, the filmmaker invites us to understand the many-faceted Sandow. Even with the man’s many faults, Elliot viewed his mentor somewhat as a god whose imperfections could be justified or overlooked because he considered him to be a key to his own success. Likewise, Sandow didn’t experience instant success, he had to climb for it, training intensely to forge his skills. As with struggling musicians and artists, his first audiences were rapt around smaller stages cheering on the strongman in bloody wresting matches or while weightlifting beauties balanced on each end of a barbell. As word of Sandow’s impressive feats spread his popularity rose quickly in the world spotlight. Still, it had been a long journey to become “Sandow” – overcoming being bullied through young adulthood by his friends, and by his father as well, who constantly belittled him and told him he would never be honoured with the statue he longed for. His turning point came with his association with the illustrious showman and starmaker Florenz Ziegfeld Jr. (wonderfully played by Olivier Maigniez). Strongman Sandow also soon became a businessman, investing in any and everything related to health and/or strength. Olivier Maigniez, who played Florenz Ziegfeld Jr. The Great War (World War I (WWI), 1914-1918) devastated Sandow’s business ventures such as international spas and clinics, and publication of a magazine was ceased. He became an inspiration to returning WWI soldiers, visiting convalescing men in hospital, one of whom had lost his sight. Where strength was needed in body and spirit of others, Sandow often personally strove to fit the bill. The film is as much about relationships – whom to love, trust, control, betray, impress and challenge – as it is about the rise-to-fame stories of Sandow and Elliot. 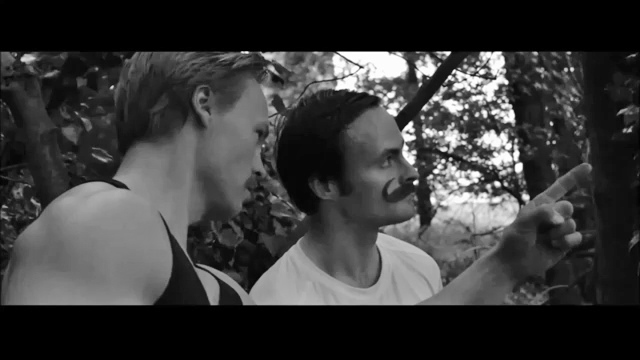 The necessary re-casting of the lead role with Finnish actor Timo Kervinen as Sandow is a bonus. Timo is totally convincing in a believable performance with his natural physique of a Victorian strongman. He skillfully conveys bravery, sometimes tinged with narcissistic macho, and contrasts Sandow’s sincerity and invincible confidence all without any braggadocio. While his Sandow is a magnificent public figure and perfect specimen of a man in a life filled with superhuman milestones, Timo also makes the strongman down-to-earth human, subject to the same fears, insecurities and sad occasions experienced by the everyday man . Timo expresses all this with amazing creative balance, and he has the audience on his side quickly, and faithfully, throughout the movie. The production design authentically captures the opulent Victorian Era in costumes, with scenes often revealing the pretense of public decorum against the clashing realities of private life. Skilled, artful camerawork and an excellent script give this lean-budgeted movie a far more impressive look and feel. A carefully chosen contemporary soundtrack refreshingly enhances the Victorian feast. Add picturesque locations, inventive action sequences and unexpected emotional outbursts, and Alexander Cooper’s Sandow is undeniably a winner. Albeit, had closer attention to sound editing been possible, the movie would’ve spilled over with even more shining moments. Cooper gives us a first class room with a view, encourages us to follow the dreams that Sandow and Elliot are chasing. He doesn’t overlook the tiniest details in an era when cocaine was legal and the opportunity Sandow has to make moving pictures with Thomas Edison. Sandow’s wife, Blanche Brookes Sandow played by Tiffany-Ellen Robinson, and perhaps more than one mistress (such as singer-actress Lillian Russell portrayed by Jane Nerissa Broadhead), were not fans or cheerleaders. They loved him the way real women love real men; indeed, because of his wife’s love he would be denied the final symbol of legend, denying him what most men, famous or unknown, have always been bestowed with at the very end – what Sandow had wanted above all since childhood. To him, it was a “symbol” of conquering power over weakness and insignificance. And something he knew would have impressed his father. You’ll understand when you watch the final scenes. The real people in his life didn’t love the legend, they loved the real man. How did you first become aware of real-life strongman Eugen Sandow? What particular things about his life encouraged you to present him and his story for a feature film? I first became aware that there was a real-life circus strongman who was the founding father of bodybuilding, when I read an article about him on a website called “Forgotten Newsmakers.” Images of travelling circus strongmen began to fill my head and I started to imagine what life might have been like for these travelling circus ‘rock stars’ before rock and roll existed. Also being a big fan of Stallone and Schwarzenegger films when growing up, I was able to put into the film, what I wanted to see. The real life Sandow travelled a lot; my father was away much of the time on business trips when I was a boy, and I’d often wonder where he was. This film was not intended as a biopic per se, although it was inspired by real characters. It’s very much fictionalized and draws on many of my own life experiences. How closely did you work with your Director of Photography (DoP) and film editor on Sandow? Very. Richard Bertenshaw is an extremely talented DoP with a bright future. We worked very closely on the shoot although he wasn’t involved in post production. His input into the film was immense, and he produced some amazing cinematography including some very impressive drone footage. Later on in post production, I instructed the editor from afar, since Birdie Sawyer was based in Maine, USA. I had started with a local editor in the UK, but as has happened before, I was let down; she decided to travel abroad for months on end, and with no response from her, I had to find a replacement. Birdie Sawyer edited the footage, but he didn’t sync all the sound together, which caused me further difficulties in getting the film completed. Your screenwriting resulted in a good, tight script mixing then-present and childhood flashbacks with many highlights of Sandow’s professional life. Knowing his history, how were you inspired to choose which elements? The story was developed by a French writer Gerard Maurez, who had initially created a script that had included many other elements I liked but were never filmed owing to time and budgetary constraints. The final draft, which featured the Elliot character telling the story, was created by me. My brother had also thought of other elements, such as Sandow visiting the blind soldier in hospital. Other elements came together from very strong improvisation by the actors. One that comes to mind is the dinner scene which follows Elliot’s training montage in the garden, and also Elliot’s training in the river; these were never planned as such since Elliot was going to be running on an athletics track, which was a difficult location to pin down. Did your shooting script have any major changes during filming, say because of new information about Sandow come to light? Were any of Sandow’s descendants involved in any way in the production? Quite a number of scenes in the script were cut due to time and budgetary constraints. No descendants of Sandow were involved in the shoot. The film opens through the point of view of a now older Launceston Elliot, Sandow’s once young fan-friend, giving a special outside-looking-in insight. The strongman became the young man’s mentor. How did you decide to use this approach? My father. He wasn’t a bodybuilder, but he was certainly a great builder. He built a large country house for me from which I receive a rental income. My father was my mentor really, and he taught me many things. He was an excellent driver and I remember him taking me out on driving lessons, for example. He would always easily beat me in squash – he played at semi-pro level against a Dutch champion in the 1970s. 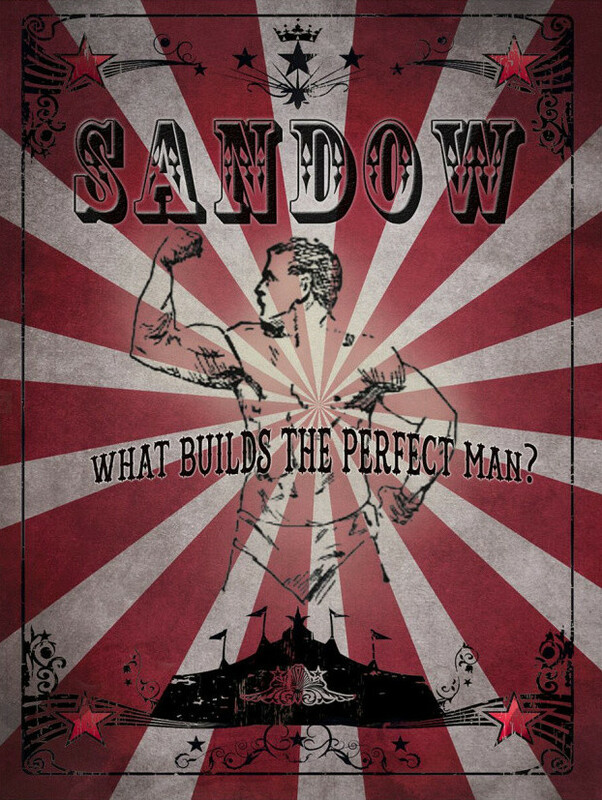 What lessons can a man like Sandow impress upon us? His father seemed to not have much faith in him. Do you feel Sandow’s motivation to succeed came from having a true mentor early on while with the circus? I think that having a mentor is an incredible thing. A trainer. A father-son type relationship is very special. My father once told me how he liked to take things apart to see how they worked, and then try to put them back together. My grandfather was not very encouraging about this – he would say ‘there he goes, Richard is breaking things again!” So, with my own son I remember how encouraging and loving my father was with me, so that means our bond is closer. In the old days of my father and grandfather, father-son relations could be quite strained and “stiff upper lip” about things. Do you think Sandow’s circus experience and training are what ultimately changed his life for the better, physically and inwardly? I think these are catalysts for growth, but Sandow above all was determined to prove his father wrong, that he could create something special that would outlast him. After a last bullying incident, he became even more determined. Ten long years later he took to the stage as a strongman Prussian wrestler and was soon “discovered” by Florenz Ziegfeld Jr., who offered Sandow fame and fortune and top-billing. Do you feel Sandow believed his own strongman “publicity” to the point he thought he was invincible? Shortly after my father died in 2014, I was at a very low point and one evening I was attacked in London and badly beaten, sustaining a black eye, scarring on my chin and severely broken teeth. I was beaten much more severely than the character in the film and I required months of extensive dental treatment. My teeth were never the same and I was now changed as a person. I was also involved in a car crash near Peterborough while driving back from London. Around that time I truly felt I’d reached rock bottom in my life. So, no – I don’t believe Sandow in the film thought he was invincible. It was a show – an act – and I made it a point that we see the humanity and reality of the man behind the facade. I was particularly a fan of the Rocky movies when I was a boy. It’s a pity that Elliot’s Olympics wrestling match was not filmed, that would’ve been a lot of fun for me. Yes, I believe the characters had much in common regarding their huge will to win. Whereas Elliot wanted a gold medal in the Olympics, Sandow was more seeking the adulation of his fans and especially, in the film, the female ones. As shown in the film, Sandow’s career changes included touring with Elliot, creating “Sandow clinics” for training athletes and the general public, and plans with Ziegfeld Jr. to produce a “Sandow Protein Powder.” Negative personal life changes suggest drug use and infidelity. Do you think Sandow had taken on too much to maintain his reputation as a strongman at the cost of his personal life? Well yes, in the film he’s seen snorting cocaine. As a larger than life figure, as a lot of bodybuilders used steroids, growth hormones and so on, the Sandow character had a tendency to take things to excess in the film. It’s ironic that he urges moderation in Elliot, just as his mentor Atilla had taught him, since it seems impossible for him to put that into practice himself. Is moderation even possible to achieve in life? Someone will always think we’re doing some things too much, or other things too little. My father always urged moderation with regard to my alcohol consumption, but for a long time I struggled with it. “Moderation in all things,” he would tell me, yet I never thought his lengthy commutes driving several hours to and from work by car could be described as moderate. 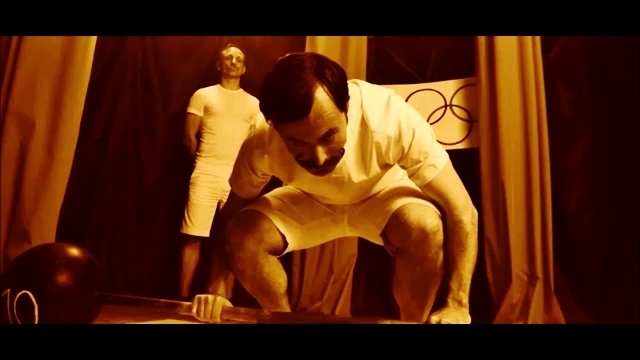 How long did you weight-train for the role of Elliot before filming the 1896 Athens Olympics scenes? I did preparation for the role in the months building up to the shoot, but as you can probably tell my physique was not ‘enhanced’ by steroids. This was intentional since I wanted a natural look that might have been seen in Victorian times. On the production design side, many of the interior and exterior locations are evocative and picturesque. How were they decided on? Thank you. Filming took place in London at Putney Vale, various mews/streets in SW1 not far from where I used to live, and in the basement of the Mostart Centre in Stoke Newington where we built the sets we needed for some key scenes. Other scenes, including Sandow’s house and the snooker room scene were filmed in and around Haddlesey House in Selby, West Yorkshire and Wharfedale Viaduct at Arthington. I chose to film in places wherever there were satisfactory locations and resources. Funding this myself I have had to be extremely cost conscious to keep spending under control. Therefore sometimes the locations I chose were sub-optimal. There’s always a trade-off. I had always intended that Sandow would be a big budget lavish production, but funding it on my own I had to use what was available at the time to get it done. Do you think Elliot remained somewhat in awe of Sandow, owing him his very life, especially regarding his mentor’s physical strength? What inspired this to be part of their relationship? My father put up a brave battle with blood cancer for 7 years, but ultimately after three rounds of chemotherapy the inevitable happened, and we had to say goodbye. I did, and do, still remain somewhat in awe of my father, from the time I fell in a bed of nettles when I was four years old and he chopped them all down with a spade. This memory inspired Sandow’s lifting the car in the movie which saved Elliot’s life after their car crash – something any loving father would attempt to save his son. Also how my father persisted and completed the house he spent the best part of ten years building. Losses are inevitable for us all, just as my own father lost his mother in a car crash. Just like Sandow and Elliot, we both have had our strengths and weaknesses, and I have dedicated this film in my father’s memory – “until I see you again.” The dedication in the end credits is a message from me to my father: “This film is dedicated to the enduring memory of Richard Vaughn Cooper.” After his death in 2014 I would meet him sometimes in my dreams, he would either be in a garden in the height of summer or in the lobby of a luxury hotel smiling at me and talking to me about moderation as he used to. I really hope we meet again some day in the next world. What stadium is featured during opening credits? In a later scene, what’s the name and location of the long arched bridge? The stadium footage is drone footage of the Olympic Stadium, Athens Greece, in present day. The long arched bridge you refer to and I mentioned earlier is Wharfedale Viaduct at Arthington. It can also be seen in the British TV series, Emmerdale. I may have mentioned I love this location, which I’d never planned to use; I was made aware of it by a crew member while we were on the Sandow house location in Yorkshire. 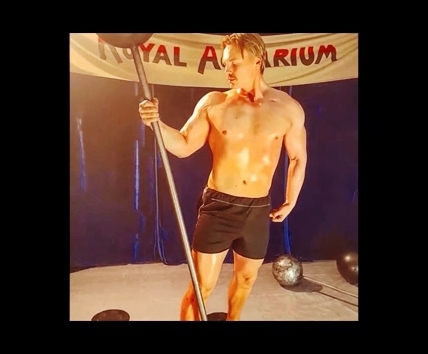 Did you immediately know you would cast Timo Kervinen as Sandow? What do you feel he brought to the role of the legendary strongman? Not right away. 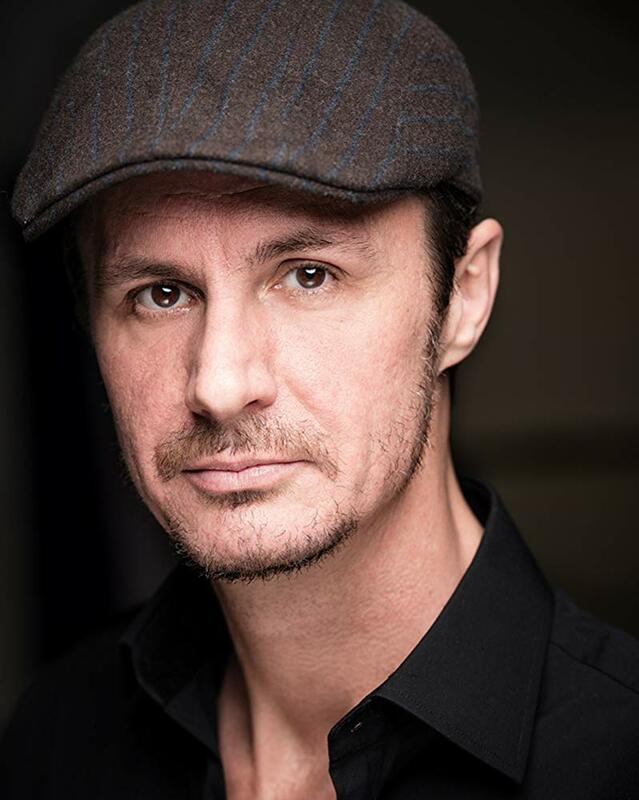 Actor-model Andrei Lenart was originally cast in the role, and he was filmed in the fundraiser trailer I made, which unfortunately failed to raise money for the film. It was only later when we couldn’t agree to the salary terms for his acting contract that I had to find a replacement. And yes, pretty soon after finding Timo, I decided the role was his. He had already played Arnold Schwarzenegger’s character in The Terminator stage show in Japan, so he ticked many boxes.